Dr. J. Vernon McGee is best known for his ”Thru the Bible” radio programs, which are broadcast around the world in more than 40 languages. He served as pastor for over 40 years and was also a teacher, lecturer, and author, producing over 200 books and booklets. A complete edition of the Thru the Bible commentary series, this five-volume set is an excellent choice for students and teachers of the Bible.It includes Dr. McGee's insightful study of each book of the Bible with in-depth, paragraph-by-paragraph discussions of key verses and passages. This commentary will assist your personal walk and ministry of God’s Word. Dr. McGee presents remarkable insights in a very easy-to-read, practical style. He includes word studies, genealogy, geography, and historical significance, yet he is never dry. McGee is practical, simple and insightful. As Dr. McGee himself said, he liked to “put the cookies on the lower shelf” so that everyone could access the riches of the Bible. Dr. McGee's seeks to meet the needs of lay Bible readers as well as clergy, and he deliberately avoids "the straightjacket of printed prose and lofty verbiage." His plain writing and lively approach make biblical truth understandable and Bible study more enjoyable. An introductory section presents guidelines for Bible study, and a detailed outline prefaces the discussion of each book. Each chapter is examined through a careful, paragraph-by-paragraph discussion of all significant verses. Convinced that solutions to all of our problems--whether on the individual or international level--can be found in the Bible, Dr. McGee focuses on its everyday practical wisdom as well as its redemptive truth. A good read but not a lot of depth. If you are on a small budget I suggest W.Weirsbe old/ New Testament Commentary.also Believers and David Guznic. 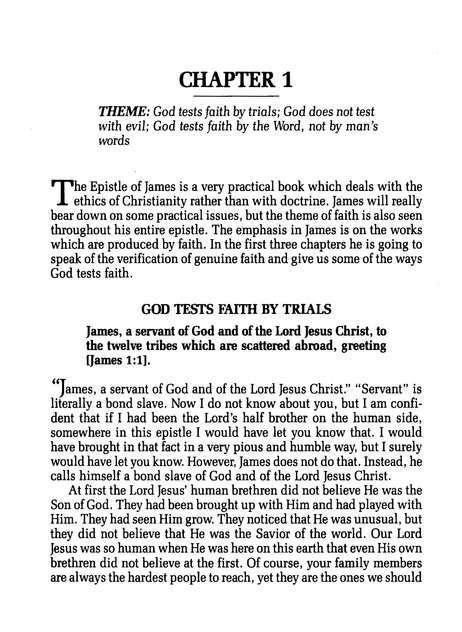 The J. Vernon McGee resource is a wonderful help for Bible Studies -- personal and group. I'm so thankful to have it as Pastor McGee's radio broadcast was instrumental in my early years as a new believer and profound as I grew in my faith and life's experiences. My mother gave me the set of books for a gift. After I retired I moved into a small apartment and gave the book set away to my church. A few years later the church burned down and the books were destroyed. This commentary reminds me of the radio program J. Vernon McGee had where he taught the Bible. Easy to understand. Dr. J. Vernon McGee is clear and reliable and a great help to one who wants to make the Bible understood by the average person. Very helpful. There is no other Bible Teacher to compare to Dr. McGee he is so simple and down to earth with his teaching, he makes the Bible come to life with his gravely voice, i have the Bound set is his through the Bible series, but having it on e-sword is much better, i highly recommend this e-sword add on to anyone using e-sword. Great set of commentaries and very easy to use inside E-Sword. I have only used it a week or so but have really enjoyed his writing. When I read the commentary I hear Vernon's voice. It give a very straightforward explanation of the text. Not too complicated or filled with big words people don't know. I recommend this source wholeheartedly. I use “Thru The Bible “ along with a number of other commentaries to provide input for my weekly adult Sunday school class. I have always loved J.Vernon McGee and his down home way of relating the Word. The way ESword integrates all these sources has greatly eased my studies. I also recently added Holman bible maps which i greatly enjoy. Keep up the great work for our Lord! I have hard back in my home library and this really helps when utilizing my tablet and computer for e-sword. Great help for understanding the Bible. Easy to understand yet very intelligent. This is a very easy format to read and understand! It's worth the cost! I've only had "Thru the Bible" for about a week but it has some insight that has been very helpful for teaching the word of God. I use three primary commentaries. This one is a good addition to use with the others. For the cost it very beneficial. I have Thru the Bible, 5 vols in book form, but this download is very helpful in preparing my Sunday school lessons. I have listened to and read J Vernon McGee for over 30 years and this is just another way to do it on the computer. So very nice to put it right along side the scripture in e-Sword now. I would recommend it to any teacher, Pastor, or anyone else that studies God's word in depth. Thru the Bible is very good so far. After having listened to his radio show for years I was happy to find out that he had a commentary. It was all that I hoped it would be; inciteful, relevant, practical and useful to use for my spiritual growth. Thanks ESS for providing this resource! Thru the Bible is a good commentary for the evangelical lay person. McGee gives a clear and concise commentary. It is not for the academic oriented. Very good commentary. A must to have for every Christian. A delightful, sensible and at times funny commentary on God's Word. When I can, I listen to Thru the Bible in my car as I am going from place to place. I'm not always able to catch the program so now I can have the comments he makes when I am focused on a passage of scripture. I have two Bible Studies that I lead, one at a nursing home and one with some of the ladies at my church. I have recently found e-Sword and the related commentaries. They are very helpful. Have now added this commentary to my teaching preparation computer, IPad and Study Computer. It is a welcomed down to earth coverage of the difficult and loved areas of the scriptures. His injection of personal thoughts and practices make for easy study and remembering the find details of the word of God. I would recommend this "Thru the Bible" to any new Christian. His presentation of the scripture is memorable in a simple way yet complete and detailed. Please disregard my initial review. I feel like a fool now. I noticed in the window for the commentary within e-sword, that there is a button to press that changes from the Book review, Chapter review, and Verse review. Once I found that I noticed that EVERYTHING from my physical copy of McGee's book on Isaiah is in face included in this program. I apologize for my earlier review. This has been a lesson for me on doing complete research of a product before getting discouraged and fearing the worse. Thanks again e-sword! I HIGHLY recommend this commentary for anyone who wishes to have a better understanding of the Bible. Great resource - simple to read, easy to apply! I enjoy reading Vernon McGee's writings, I cannot say I agree with everything he writes but I agree with most of it especially the salvation message. He gives many insights that I may have missed otherwise. DR McGee works on the Bible bus (as he called it), is some of the best, down to earth, straight forward work anyone can find. It is easy to read and more important easy to understand. I believe it is one of or if not the best study helps in all Bible training out there. Easy installation and integration with KJV. J. Vernon McGee has always helped bring God's word alive for me, whether in audio or written format. I use a hand me down 1'st generation iPad with e-sword for bible reading and study with large fonts! Thanks!! The material is easy to understand,has a practical knowledge that's takes you to look for a deeper understanding of the word of God.To enjoy the word. The worth of this source is great for any one that's wants a better understanding and relationship with Jesus and his word. Enjoying J Vernon McGee's "Through the Bible" for over a year now, as a fully integrated commentary to the Bible translations I use in Esword. 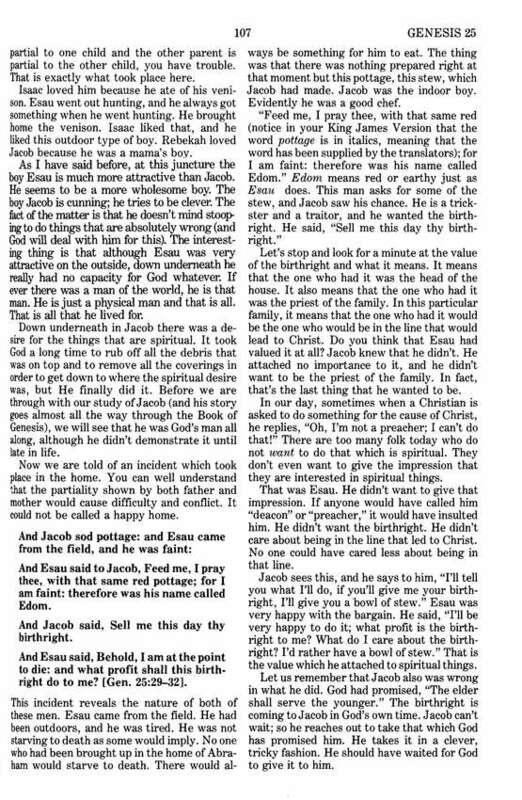 More than three decades later the spirit of truth reminds me of the beginning of my walk and the over the air radio broadcasts of Dr. McGee as I went along on my first five-year Bible bus trip via both FM and AM radio. His genius is putting the cookies on the lowest shelf reachable by anyone. But, as I have gotten to know my God and Savior, a picture of this post man, this reporter, this farmer spreading the seeds of the gospel has also come into view. The fruit which Dr. McGee saw only as listeners responded and readers wrote prepared me for practical expectations in my ministry. Gauging the execution of my calling through the real lives of believers, the ever present Holy Spirit, and the wisdom imbued into the word of God. The trials of his illnesses, ministry and radio ministry, in the context of the Southern California culture deliver a commentary whose southern drawl gives weight as counterpoint to one of my other teachers, John MacArthur. MaGee believes that the word of God has no error in it, and mostly delivers succinct narrative seasoned with cautions of cults and errors. A good example of that is his commentary that differentiates preparing to withstand evil days versus escaping the wrath of God during the great tribulation. His commentary coupled with biblical cross-references, the study of cults and doctrines of demons, and my other teachers comments are, God willing, preparing me to deliver the truth about who God is and who we are. I loved Dr. McGee's recorded daily sermons and teachings on God's Word on KFYO radio in Lubbock, Texas, for years after he had been glorified and joined Jesus in heaven. I cannot recall ever hearing anything from his lips with which I didn't agree wholeheartedly. The boisterous "Amen! "s could easily be heard in the next room quite often. Now I have them in print to enjoy for whatever time God gives me before I join them both for all time. Many thanks to Bro. Meyers for his work and his willingness to share it through e-Sword! J Vernon McGhee really does a nice job of breaking down verses so anyone can understand. I have been pleased with this commentary and the Henry as well. It gives some insight on what the scriptures may mean and is a great study tool. These commentaries open up the meaning of so many bible verses. Much factual background coupled with Dr. Magee's wit and wisdom. 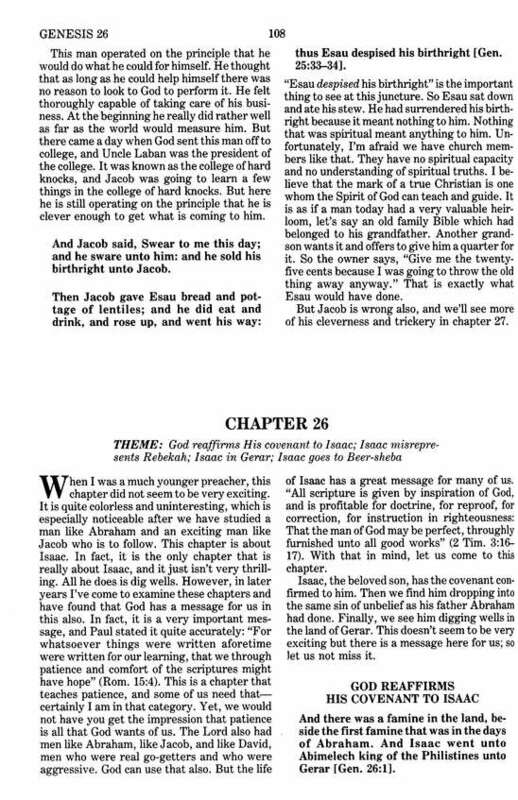 I have found J Vernon McGee to be conservative on his comments and insightful as to rightly dividing the word of God. After changing to Windows 10 I lost the old commentary I had for the old E-Sword. I am getting a new one and would not be without McGee's commentary. He has chapter summaries, verse comments and book comments. Dr. McGee's Thru The Bible is bit too folksy for some folks, but I find his comments useful and well worth reading. I do not have words to tell how e-sword has helped me in preparing sermons. All the material is great and very easy to use. In writing sermons there is much that I just copy and paste. E-Sword is the greatest time saving research tool I have ever found. I have used it for years. Have always loved Dr. McGee. I loved listening to him on his radio broadcasts and with the E-vesion it makes an excellent addition to my Bible studies. As a Precept leader, the Bible is the only source we use. But every once in a while, there's a verse that leaves me flummoxed. As a new Christian, I listened to J. Vernon McGee on the radio. Commentaries are nothing but someone's opinion and anybody can write one. I remember once when 2 students, one of whom had obviously read a commentary, made declarations: one that the rider on the white horse in Rev 6:2 is Jesus, the other that he is the AntiChrist. J. Vernon's commentary is saturated in a combination of the Holy Spirit, wisdom, understanding, years of study, and humor. I can hear him speaking as I read. He's my favorite go-to man. I have been a fan of J. Vernon McGee's radio program for many years and have been on the Bible Bus 5 year program. To have this resource for e-sword on my iPhone is amazing. McGee puts the Bible "On the bottom shelf where the kiddies can reach it." He definitely gets into the meat of God's Word but in a way that we can all relate. I can't wait to get an iPad mini and use it there. May God Bless your study of His Word with this resource. I love Esword, it is a good deal every day. When I was younger, my Father, a Deacon in the United Methodist Church, had a set and he referred to it constantly. Dog eared and marked with underlining. He loved them. I wanted to get a set of my own since his went to another. I don't have his margin notes and underlines, but my copy, although not dogeared, is referred to quite often. Well worth the price. This is a wonderful resource to have while you study God's word. I use it with E-sword and those two things together to open up the bible to me. I am enjoying this commentary. It seems to have comments on each verse and in a down home writings. I have been listening to Vernon McGee for many many years on the radio, now he's just a click away. Love this product, it has helped me study and understand the Word. My wonderful mother gave me the book, Volume 5 several years ago for Christmas. I then bought the complete series for the both of us. But, now the 5 volumes are available for e-sword is a blessing. I no longer have to go to my library to get a book, all information is right in front of me. It has got to be one of the best additions to e-sword that I have found to date. Excellent if you are McGee. Not for everyone but he clarifies things for me. I have several commentaries and I like McGee the best. He not only amplifies scripture but has side lights of history, geography. etc. I have listened to and read Dr. McGee's commentaries almost all my Life in Christ - about 40 years now - I've owned his hardback edition for many of those years and was pleased to add them to my e-sword collection. After carrying around each volume in the five volume set, this is a welcome edition to my electronic library. While saving on all of that heavy lifting, the only downside is the integration with e-sword itself. You can flip page by page through the commentary, but you can't navigate through the books or verses without first changing the book and verse in the Bible tab of e-sword first and then coming back to the commentary. For the most part I will concede that when you are reading the commentary you start at a verse and flip forward; but frequently I find myself going down rabbit trails that take me temporarily from the book and verse that I am in to another portion of scripture and it would be helpful if there was a browse feature built into the commentary like there is in any book. The up side is that now I can give away my five volume set and free up much needed shelf space in my library! It's ok. Some commentaries are like Cracker Jacks. You go through 90 percent and it's just carmel popcorn, but 1 out of every 10 bites you get a peanut too, and that bite is great. J Vernon McGee is much better than that. 7 out of 10. I think if I did not have some other commentaries, like "The Preacher's Commentary," I would have thought this guy totatlly hit it out of the park. So many commentaries are dry and state the obvious, and in some parts this commentary is like that, but in many parts he does give great anecdotes and insights. Perhaps if I wasn't so spoiled with so many great resources, I'd give him a better review. I think most of us who listen to the radio have at one point listened to J. Vernon McGee. I purchased this set because I value the teachings that I have already received from his radio ministry. Recently I used the commentary to help me research the book of Jude. Wow. The insight and information blew me away. When McGee studied he studied and his commentary reveals his passion and respect for God's written Word. I've always loved hearing Dr. McGee and through listening to him I have come to know that he was absolutely right. I highly advise this module for e-Sword. To have McGee at your fingertips is great! And being used by e-Sword, there are tooltips to help you dig deeper. It's great! Thanks so much! I always enjoyed listening to J Vernon McGee. Reading his commentaries is just like hearing him on the radio. They are good reading to encourage the soul. It's very early in the use of "Thru the Bible, 5 Vols. for e-Sword" It might take me several months to beable to properly evaluate it. But so far it has been quite useful in my bible study. I am a missionary in Haiti. This commentary cuts through all the extra stuff that just dose not translate well and gets to the meat of the subject. It helps me in my sermon prep and classroom notes as well. Great commentary with down to earth understanding. J. Vernon McGee always reminds me of a grandfather talking to his grandchildren sitting at his feet. I have heard J. Vernon McGee on the radio for decades, even after he died. I have never heard anything from himthat I thot was heretical. I wanted this enuf to pay for it. I am not sure that I will read the entire thing before I die, but I am glad that it is a part of my library. In 1907 Mark Twain wrote the short story "Captain Stormfield's Visit to Heaven". The story idea is heaven is hell if your cannot speak the language. So what is the language? I go to E-sword. I use E-sword daily as a dictionary, a word look-up to understand the Hebrew and Greek etymology, ideas, and concepts behind key biblical words. Text is constructed from paragraphs, constructed of sentences, formed around key words used by the author, in the cultural times of the author. Webster is not the language of heaven. 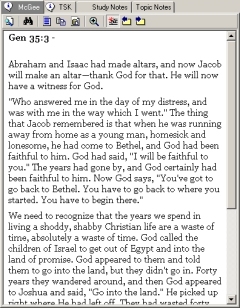 Doing word lookup in "Bible", then "Commentary on relevant OT and NT passages, and "Dictionary" one learns the authentic language of heaven that makes sense of the biblical passages. 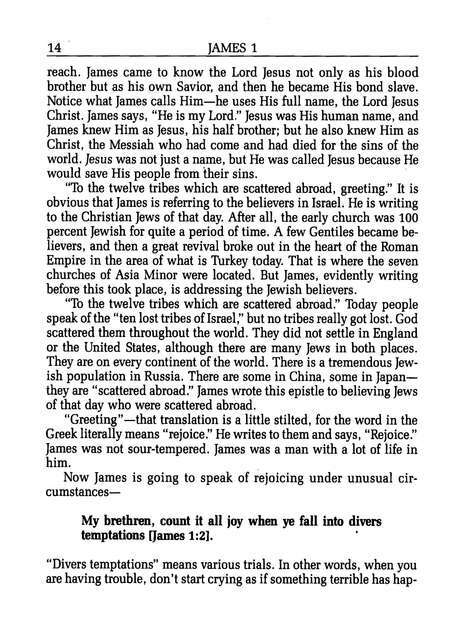 J. Vernon McGee's commentary on the whole Bible is written in a language that's easy to understand. It is complete (he doesn't dodge the difficult verses). It is accurate and it constantly points back to the purpose of God's Word... To encourage the reader to know and walk closer with the Lord Jesus. Linking it to e-Sword adds a significant advantage to the serious Bible student and is an encouraging resource for Christ followers everywhere. J Vernon McGee never said a word that I did not want to hear. And now I get to hear the books, in all their glory, through from his introduction in entirety. I just love this way of listening and receiving His word. Thank you e-Sword for making this possible. I have used Dr McGee's 5 volume set for over 20 plus years to help with preparation with an adult Bible Study I was teaching. His work is easy to understand and has many personal applications and is Biblically sound. He goes Thru The Whole Bible so it is a complete work. I love the new E-Sword for iPad because as you read through a passage it links verse by verse with Dr McGee's commentary. Dr McGee has excellent notes and outlines on the entire Bible. I have found over time that Dr McGee's work is one I always goto to study God's Word and the E-Sword app just makes it easier and quicker. It is also much lighter then the original 5 volume set. Our original 5 volume set is dog eared and worn from much use. I have purchased his work in other electronic formats and the new E-Sword app is by far the easiest and best laid out of any. I cannot think of any other work that is as complete and easy to use and understand. An easy 5 Star rating. Lots of worthwhile useable information in an easy to understand format. Just like his radio program. You can almost hear him talking as you read through parts of the commentary. When it comes to teaching the Bible, J Vernon McGee has done a work that has outlived his natural life. In order to reap the full blessings of Gods Word, we work together (Eph 4:12) and J Vernon McGee's commentary is not only great for study, but great for teaching. Within this five volume commentary set you will find valuable insight, spiritual depth and the power of God being revealed in and through your life. Your spiritual walk with Jesus Christ will flourish as you incorporate this into your daily study life and when you do grow, share it with someone else! God Bless! 5 STARS, hands down! I tune in to Dr. McGee as often as I can. My wife and I had the privilege of sitting in the classroom as Dr. McGee taught the O.T & N.T. This went on for two years. What a heritage we have in his teachings. When E-study offered his 5 volume Through the Bible Series, I grabbed it. I have the books on my shelf,but with digital version I can do so much more as I teach a Bible class at our local Senior Center. Thank you for making it available in this format. Wow, what a useful tool. It doesn’t matter if I am using it for personal study or for preparing sermons and or other lessons; this is one of the first set of books I go to. These are easy to understand and bring the reader to a deeper understanding to the scriptures. I have used eSword for many years in church and at home. A very good bible program, and this is a very usefull addition. I met J. Vernon McGee in person and he was a very good teacher. I have been in ministry for over 30 years and I've used numerous commentaries from time to time. This exceeds all others beyond a doubt. It is accurate, concise, and easy to understand. If you are a novice or well schooled theologiean you will benefit from the use of this informative commentary. People still call and want to talk with him! His work is timeless and down to earth. All will benefit from his commentaries. Remember, "prayer changes things!" I have listened to Thru the Bible on CD's and it was a great resource for small group studies. Having Dr. McGee's material on my computer so I can use it in printed lesson plans is a real help. I have used several computer study tools over the years for preparing teachings and sermons. Today, e-Sword is my primary study tool. What a blessing it is to have all the resources e-Sword offers at your finger-tips for study and writing sermons. Commentaries, such as, Thru the Bible, by J. Vernon McGee are priceless. I love Thru The Bible with Vernon McGee. It is a valuable resource in my daily Bible studies and sermon preperation. Thanks so much for making it avaliable for e-Sword. I have tried several Bible programs and none of them can compare to e-Sword. E-Sword has always been easy to use, but the recent changes in the manner in which the add-ons from eStudySource are used has made it even better! Now I use only e-Sword. All of my sermon preparation is done using e-Sword. Thanks for helping make my job an even greater pleasure! The author is well known. His work is well written. His comments are concise. Clear comment with no nonsence or over-spiritualisation. I have used an online audio version of Dr. McGee's TTB for years as a resource when preparing Bible study lessons. I was excited to see it was available for eSword as an add-on module, and at an affordable price. I particularly like that I can instantly see Dr. McGee's comment on a specific verse without having to find it within his comments on a series of verses around the "target" verse. J. Vernon McGee's commentaries are a great source of information. I think Dr McGee's writtings and commentaries are the most insightful tools on the market today for the serious student of GOD'S word. Although he entered his eternal rest in 1988, his writing are still alive and will be until this earth age ends. He was a very intelligent man (that believed in the binary, plenary verbal inspiration of the Bible)that presented the Bible in a very understandable way, that is correct time line perspective. Well worth the money. If you are looking for some modern day presentation of God's word that goes along with the modern day church movement and the NIV, then this, mores likely, is not for you. "Thru the Bible" Commentary is a must for any serious student of God's Word. Very satisfied with everything from e-sword. McGee is a great expositor of the word. 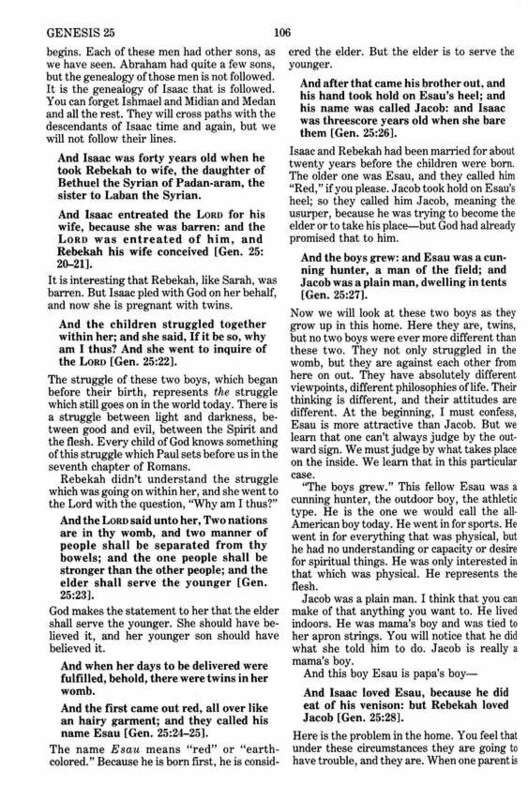 I used to listen to him daily when I lived in the US and found him to be one, easy to listen to and two, the teaching was very edifying. To now be able to read his comments on the scriptures as I study them, this is a great compliment to the other resources that are on e-Sword and a personal blessing as I receive his wonderful insight to God's word. This is great value for such a wealth of solid Bible commentary and a good tool in the hands of any student of the word. The "Thru The Bible" commentary by the late Dr. J. Vernon McGee is thoughtful, theologically and doctrinally sound, while maintaining great readibility and usability. It, like all of the resources from e-Sword, works seamlessly within the program. I highly recommend it for all lovers of God's Word! Both the printed five books AND this download keyed to E-Sword are equally valuable in their own way. McGee's Thru the Bible is a real gem. As a young church leader, i often have problems when attempting to keep my sermons as simple as possible, and Thru the Bible helps me do just that. Real life illustrations mixed with historical support makes this commentary very fun and easy to use. 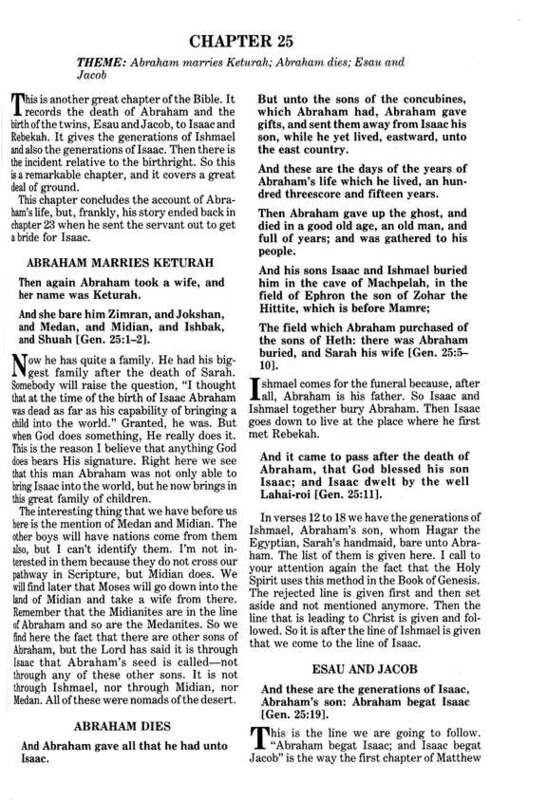 I find e-Sword the best Bible resource available and use it every day. Commentaries are helpful in supporting study with in-depth reviews and comments. I purchased this commentary in the hope that a contemporary writer would have a good insight using the latest state of affairs in the world and in the light of contemporary events. I am, however, disappointed as the commentary is shallow and condescending. I will continue to use it. All commentaries should be judged in their use by the very scriptures they comment on. We can always trust the Holy Spirit to guide us if we ask Him. God bless the work and development of e-Sword. McGee has some wonderful insights as he walks through the Bible. He makes the Bible come alive and personal. I use his thoughts when preparing Bible studies and sermons. There may be a few places where I disagree with him but not everyone will agree with everyone else and that is ok.